As it is, Bitcoin Cash describes itself as a Bitcoin alternative and a coin which operates as envisioned by Satoshi Nakamoto: that of acting as a medium of exchange, supplementing and eventually replacing political money. And they are doing a pretty good job despite dropping market valuation, network difficulty and transactional volumes. With the Wikimedia Foundation changing payment processors and preferring BitPay over CoinBase, donors from all over the world can make BCH contributions. Hopefully, this would help spur participation, draw demand which would eventually help lift the sixth most valuable coin from current lows. Already, there are hints of a recovery. Aside from price action, their adoption drive is paying dividends. Roger Ver, the defender of the network in recent YouTube video said Bitcoin Cash has sealed a deal with ANA Group’s Alliance Cargo Direct. ANA Group describes itself as an inspiration of Japan providing “high-quality international distribution infrastructure utilizing our cargo aircraft”. Unfortunately, he couldn’t divulge more because of Japan’s FSA stringent laws governing insider trading. All the same, Ver said they will make public their partnership adding that there were more publicly trading companies that would soon be looped in the network. Like XRP, BCH is on an uptrend and at the time of writing the fifth most valuable coin was up 3.5 percent. 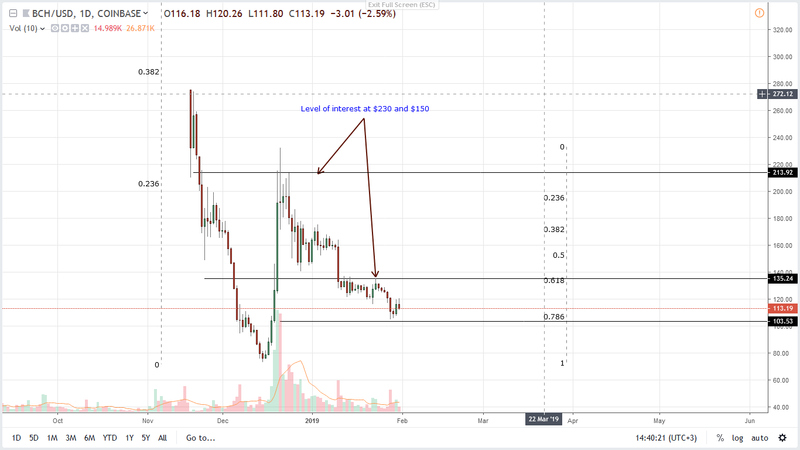 This is impressive and sets the ground for further gains that may see BCH prices rally towards $230 or higher as laid out in our previous BCH/USD trade plans. Note that there is support even from a technical point of view. First, BCH is trending below 2017 lows meaning sellers were so vicious, they wiped out 2017 gains. Because of that, we expect a recovery, a bounce back, that will at least lift prices back to $250 or 2017 lows. Spurred by across the board shift of crypto sentiment, we expect BCH to be a benefactor. In that case, it is likely that the $70 floors set by Dec 2018 lows will be the launching pad for further higher highs in coming days. Note that BCH is trading within a short-term bull trend with caps at $250 or Dec 2018 highs. After more than 35 days of lower lows, we now have a double bar bull reversal pattern off the 78.6 percent mark. This is bullish but there will be more reprieve for traders if there is momentum driving prices above $135—triggering risk-off traders angling to buy—and later $230—igniting risk averse traders with grand targets at $400—the main breakout level—previous support now resistance. $400 is pre-Bitcoin Cash hard fork supports and very significant in our analysis. Momentum is building up. However, for bulls to be in control then we must see a high-volume break and close above $135. That means, if there would be a confirmation, then the bar must register high volumes exceeding those of Jan 28—62k and hopefully drive prices above $135 forcing aggressive traders to enter the trade. Only then will there be a bull’s confirmation.